Hortus Camdenensis | Gladiolus x insignis Paxt. Gladiolus carneus x Gladiolus cardinalis hybrid. ‘A handsome hybrid, with very long, narrow leaves, and apparently drooping flower stalks, on which the blossoms are borne chiefly on the upper side. Flowers of a rich and reddish crimson hue, having a dash of bluish purple in the centre of the lower petals.’ The plant was drawn at Lucombe and Pince’s nursery. They had purchased Colville’s stock some years earlier. [MB p.223/1840]. Paxton's Dictionary also describes it as crimson, growing to 45cm, while the Floricultural Cabinet describes it as deep rose-crimson. [FC p.257/1851]. ‘A good variety in the ‘Ramosus’ tribe, together with G. splendens.’ [Gard. Chron. 1851]. Gladiolus x insignis represents a group of richly coloured, winter growing, early-flowering hybrids, usually known as Gladiolus x nanus, raised about 1835 by Colville’s of Chelsea, one of the most gorgeous and beautiful of the early flowering varieties with brilliant scarlet flowers flaked with purple. [Fish]. G. insignis is presumably one of the ‘many cultivars and named varieties’ described by Fish as being available in the 19th century. His designation of early flowering is at odds with more contemporary descriptions. For example, Bass and Brown, in an advertisement in The Gardeners Chronicle describe insignis as a Ramosus variety, flowering August to November, with large rosy crimson flowers. [GC p.674/1853]. Published in the 1845, 1850 and 1857 catalogues [B.146/1845]. Obtained from Veitch’s Nursery, brought out from England by Captain P. P. King in 1849. The plant list entry is marked ‘o’, which signifies that Macarthur believed it to be a new introduction to the colony, yet it first appeared in the 1845 catalogue. [ML A1980-3]. It was probably introduced earlier by John Bidwill. 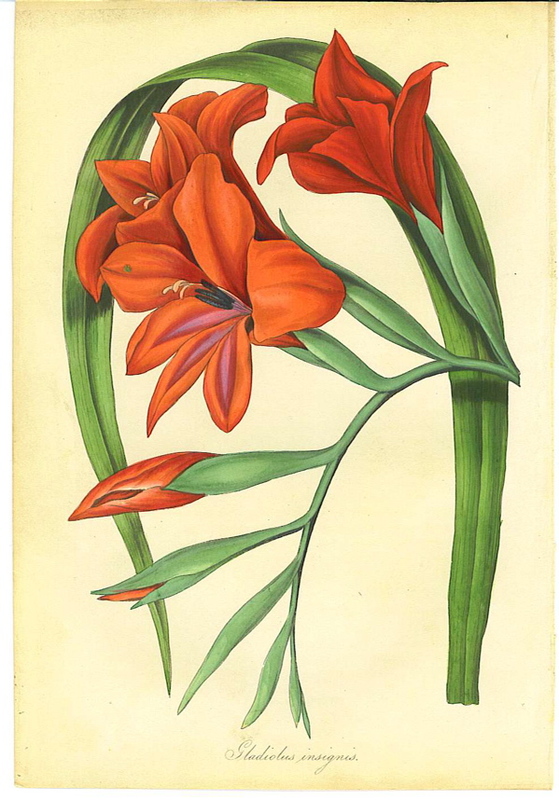 [See Gladiolus cardinalis Curt.]. A variety called Gladiolus ‘Insignis’ is still known in Australia. It appears to be identical to G. x nanus ‘Spitfire’, a G carneus x G. cardinalis hybrid and is still available in the trade. [Reid, personal communication].